What is The Best Tattoo Machine & Gun for a Beginner? When you’re just starting out as a tattoo artist it’s important to get off on the right foot with some quality machines, but what is the best tattoo machine for a beginner? Well, like many things in the tattoo industry, that is a long-standing debate. However, we have here some great recommendations that will help you hit the ground running, and start producing really great tattoos! What Should You Consider In A Good Tattoo Machine For a Beginner? 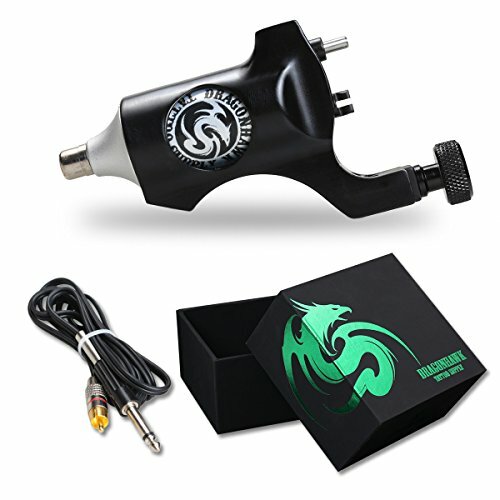 The Dragonhawk Rotary Space Aluminum Tattoo Machine is easily the best rotary tattoo machine for the money. Rivaling its counterparts that will easily set you back a few hundred dollars. When you’re a beginner tattoo artist, you need a high quality, hard hitting, and easy to use machine which makes this Dragonhawk perfect. Made from space aluminum, the unibody is lightweight (4.15oz) and comfortable in your hand. You’ll appreciate the low noise of this machine. With a stroke length of 3.5 mm and an operating voltage of 7-10 V DC, this plug-in-play rotary tattoo machine is perfect for lining (7V-8.5V) or shading (8V-10V). The best thing about the Dragonhawk Rotary Space Aluminum Tattoo Machine is the design and functionality. It’s lightweight and built to do everything you need to complete a tattoo—from lining to packing in color. You don’t have to worry about keeping rubber bands with this machine. To hold the needle in place, you simply “click” it into the small black clamp just above the tattoo grip, and it’s ready to go. For a beginner, this simplicity is not rivaled anywhere else in the industry. Also, since it’s a rotary, you don’t need to worry about switching the stroke length to change from lining to shading. Instead, you completely control everything by the power voltage of your power supply. Tattoo artists love this machine, everyone that’s used it says it runs smoothly, doesn’t overheat, and is ridiculously quiet. There are a couple of things you need to look out for with this tattoo machine. First off, it’s made from plastic. Which, while it does make it lightweight, just prevents it from ”feeling” like a high-quality tattoo machine. Some users have reported a short motor lifespan, but for most, it doesn’t bog down even during four-hour sessions. You could also stand to upgrade your power cord, but this can be said about any cable that comes with a tattoo machine. Overall what makes this the best tattoo machine for a beginner is it’s easy to use, allowing you to focus on the technical aspects of your art and not a machine. It’s a great price for the quality of the machine and saves time during the tattoo process thanks to the needle clamp mechanism. Getbetterlife is a reputable company known for their high quality, low cost, tattoo machines. In fact, some would say they put out the best low cost tattoo machines. What's their best model for a beginner? I would have to give that honor to the Getbetterlife Pro Rotary Tattoo Machine. This Getbetterlife Rotary Tattoo Machine is made with a high quality polished aluminum alloy, making it super lightweight. The machine comes with a high speed mute motor designed to run fast with low noise and vibrations. It has a good high quality sturdy feel, you know as soon as it’s in your hands you have a good machine. What makes this a great tattoo machine for a beginner? 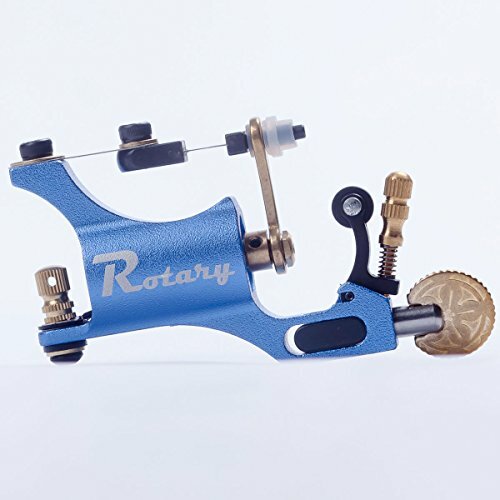 For starters, it’s simplicity as a rotary makes it great for a beginner, but also, the quality that it runs at will help you just focus on tattooing. The fact that it won't overheat after such long sessions makes it great for practicing all day long while you work to master your craft, and the needle fixed design ensures that the needle won’t swing on you while you are working. Being made from an aluminum alloy makes it really lightweight enabling you to use it for extended periods of time without putting real stress on your arm and hand. Which as a beginner, until you build up the muscle, can be a big life saver. Some artists, after extended use, notice it doesn’t hit as hard as it did towards the beginning of the session, but other than that tattoo artists have nothing but good things to say about this machine. At the end of the day, this is a great tattoo machine for beginners, because not only is it a very low price point, but it being a lightweight rotary allows you to practice for longer periods of time while you hone your skill. First off, if you want to focus on your artistic skills as a tattoo artist out of the gate, and not on the technical aspects of how to tune several different coil tattoo machines to get a single tattoo done, then the best tattoo machine for a beginners such as yourself will be a rotary tattoo machine. As I stated earlier, when using a rotary tattoo machine you take out all of the issues surrounding tuning your tattoo machine to be a liner or a shader, needing multiple machines, so on and so forth. Instead, you can just focus on the tattoo since rotaries act as both a liner and a shader in one machine with no tuning needed! You just have to adjust the needle depth and swap out needle groupings! Because of this rotaries are often referred to as "Plug n Play"
Now, plug n play is a whole lot easier than setting up multiple tattoo machines. Which, let’s face it, for a beginner tattoo artist can be a pretty daunting task! So keep reading to find out what the best tattoo machine for a beginner is. The best tattoo machine for a beginner is going to be different from everyone you ask. Some artists swear by coils, while some swear by rotaries. Everything you come across in the tattoo industry is just going to come down to personal preference. When looking for a beginner machine, it’s best to go with a machine that you will feel comfortable with, and a simple machine with not a bunch of gadgets that will ultimately just leave you confused. Also, don’t make a huge investment in your first machine. You don’t want to spend $400-$600 on a tattoo machine to not love how it feels in your hand or how it works. Before you spend a hefty sum of money on a machine, play around with several different styles: true rotaries, coils, rotaries with armature bars, cartridge grips, etc. There are tons out there, so don’t get pigeonholed into one style. Test the ink on them all, and always be expanding your horizons as a tattoo artist.